Hot forged, followed by lathe machining. This technique allows a limited machining and reduces material losses, significantly improves the mechanical properties and provides a good surface without porosity. – Through a hole in the enclosure. The enclosure is sandwiched between the fitting and a stamped inner ring. Bumps in the ring provide self-centering. This stamped ring costs only 10% of the conventional threaded inner rings. On 2”, M77x2 and 2 ½” diameters, the drilling diameter is identical to models using a threaded ring. Therefore, no special drill diameter is needed. – 4 x 2 mm section, 50 Shore silicone gasket with anti-creep rib, absorbs flatness differences, and remains in place during tightening. The grounding terminal does not impinge on the surface used for the heating elements brazing, allowing the larger diameter heating elements tubes and larger bending radius, and room for a center pocket tube. See general design of the grounding hereunder. 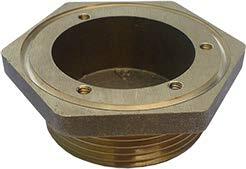 Pressure resistance: 2 MPa (Fitting undrilled and without heating elements). The minimum wall thickness meets the Schedule 10S specs. it happens in “Hard soldering” and brazing) and also makes them unsuitable for oxy-acetylene welding. The alloy used for these connections has a low lead content, which improves its brazing ability. 27.2 The clamping means of earthing terminals shall be adequately secured against accidental loosening. It shall not be possible to loosen the conductors without the aid of a tool. 27.4 All parts of the earthing terminal intended for the connection of external conductors shall be such that there is no risk of corrosion resulting from contact between these parts and the copper of the earthing conductor or any other metal in contact with these parts. 28.1 Earth connections which failures may provide a lack of earthing continuity shall withstand the mechanical stresses occurring in normal use. Screws used for connections providing earthing continuity shall screw into metal. – Thread-cutting (self-tapping) screws shall not be used if they are likely to be operated by the user or installer. 28.4 Screws and nuts that make a mechanical connection between different parts of the appliance shall be secured against loosening if they also make connections providing earthing continuity. – Sealing compound that softens on heating provides satisfactory security only for screw connections not subject to torsion in normal use.